THIS MONDAY morning Microsoft already googlebombs or ‘spams’/litters “Linux” news feeds with promotion of its proprietary software (there’s no news, just rehash), led by Microsoft boosters who write their headlines accordingly (links omitted, not inadvertently), mirroring what we saw last Monday (also in the morning). We don’t think that’s sheer coincidence; it looks like a media strategy. 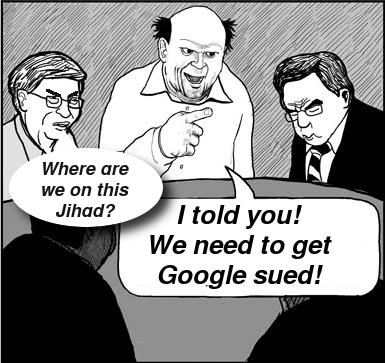 Nice to see, on the other hand, is that so many Linux sites are now speaking about Microsoft's patent war on Linux/Android — a long war with software patents as a weapon and cash cow (lawyers typically win when there is litigation, but in the case of Microsoft there is no litigation, just blackmail/extortion). There are even high-profile videos on the subject — surely something Microsoft would wish to distract from while Horacio Gutierrez walks away. We have warned about this for many years. “Look what Microsoft is doing to Android right now (other than the patent extortion). See what Cyanogen is doing for Microsoft. Classic EEE.”Anyone who still honestly believes that Microsoft “loves Linux” must be rather gullible or poorly informed. Remember how Microsoft infiltrated Docker events in 2015 in order to spread the "love" propaganda (even pins, like there’s a voodoo doll somewhere). It’s all nonsense. Now, having infiltrated Docker sufficiently, there is an embrace, extend, extinguish (EEE) strategy with the NSA-friendly Azure (see articles such as “Microsoft continues open-source support with Docker storage plugin for Azure cloud platform”, “Microsoft continues open source push with Docker storage plugin for Azure”, or “Microsoft offers persistent Docker volumes with Azure File Storage”). Shipping people’s data to a proprietary server with NSA surveillance is not an “open source push” as IDG put it in its headline; it’s self-serving EEE. So much for Docker “security” (unless it’s “national security”). Is a proprietary software move evidence of “love” from Microsoft? The EEE strategy always goes like this. First they need to embrace (with “love”), then they’ll take over (“extend”, e.g. Azure or SQL Server), and later they can extinguish (e.g. move SQL Server/Linux setups to Windows, with lower/promotional cost/rate and more features/incentives). It doesn’t take a rocket scientist to ‘get’ it. Look what Microsoft is doing to Android right now (other than the patent extortion). See what Cyanogen is doing for Microsoft. Classic EEE. Never forget how Microsoft’s Elop killed Nokia while it was exploring a lot of Linux, shortly after it had become one of the top contributors to Linux (the kernel and beyond). Microsoft also used moles to kill Yahoo. Notice how Nokia is being deprecated/taken out of existence, to this date. To quote this new page from HERE, “HERE apps will no longer work on devices running Windows 10 mobile” (so it’s effectively dead, even for Windows).